Ever since someone fired the first rock from bamboo with black powder, man has been on a constant quest for a better more accurate sight. Today's electronic sights use holographic imaging to push a target aperture into the shooter's field of view. The US military just announced the X25 laser and; smart ammunition weapon system which represents the pinnacle of hand held weaponry sighting...providing in essence a hand help guidance missile system for troops. For us mere civilians that don't have $35K for a brand new X25 (ammo not included), we have to resort to swapping sights. Swapping out sights can be simple enough. Picking a rear sight style is pretty easy today as the venerable AR style peep sight has been adapted and adopted as the to preeminent high accuracy fast targeting design. The eye naturally centers things in circles, so mentally it makes sense that for speed and accuracy peering through a rear peep will up your accuracy more than looking over a notch. My focus of this experiment was to test a couple theories. First off was to swap my rear semi-buckhorn sight on my Henry 357 Magnum Big Boy Leverage action for a peep sight and second was to then try out KNS Crosshair front sights on the same rifle. 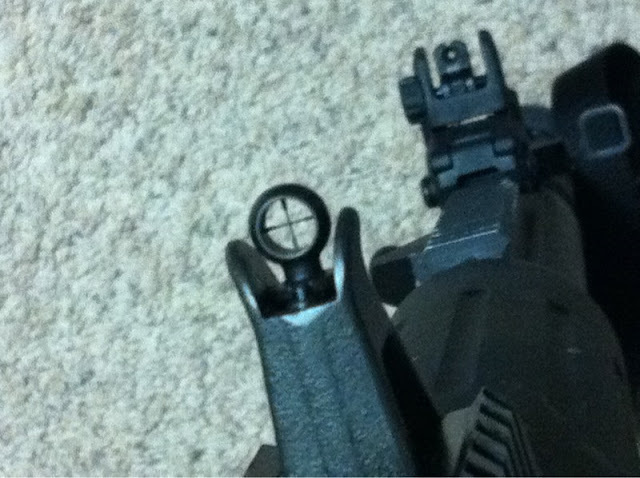 The second test was to swap out my stock front sight post on my DPMS AP4 with a KNS Crosshair Front Sight. Front peep sights paired with rear peep sights have long been the choice of long distance iron sight competitors for a simple reason... they work and provide stunning open sight accuracy. These have been adapted in many ways in the form of front tunnel aperture/peep sights for hunting guns, to AR focused Levang style front peep sights designed for fast combat multiple target shooting. Due to a slew of poor ratings I nixed my test of the Levang AR sight in favor of the KNS crosshair sight. 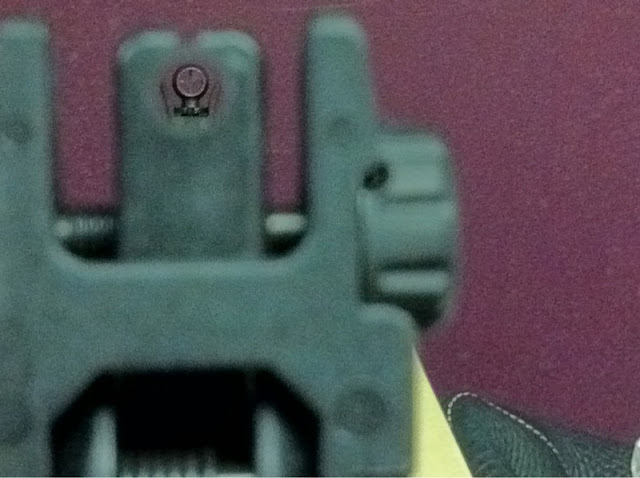 KNS sights are very unique in an industry of post and bead sights, and feature a aperture/peep front sight design with cross hairs for dovetail mounted and screw in AR style sights. They also offer a few other options for other rifle mounts. The KNS sights are available in a regular or thicker heavier duty hood/ring that offers additional protection to the very durable beryllium formed wire reticle and extra light control. The cross hairs are available in either regular or a graduated duplex style reticle. All models are made of solid brass with beryllium formed wire reticle and are approximately 1/4" in diameter and provide a great open field of view. I equipped both my Henry and AP4 with KNS Hooded Duplex reticle front sights and my Henry with a Skinner rear peep sight. Installation was straight forward on both rifles with the more challenging driving out and mounting the new KNS sight in the dovetail mount on my Henry. At first I though Oh God what have I done, this thing just slips in, then I remembered to read the directions which addresses this issue and recommends a shim and/or dab of loctite. I did both and made my shim from a trimmed .22LR casing and loctited everything in.... easier than I initially thought. The rear Skinner sight slide in without an issue, however I do wish they would sell a longer version to cover the scope mount screws. Overall the Skinner rear and KNS front sight matched the period of the Henry and definitely looks better than many sights I have seen people add. 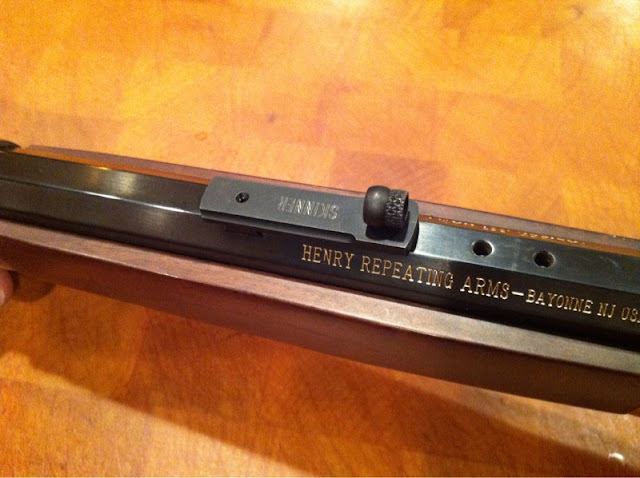 Skinner offers thier rear sight in brass as well which now I wish I would have opted for and then polished to match the Henry accessories. 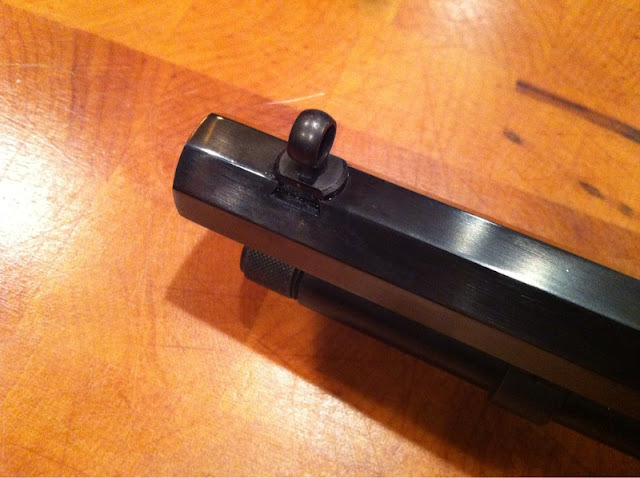 The KNS could also be polished to a brass luster as it is a blackened brass sight. Accuracy improvements were amazing with groups tightening by 50% overall... the buckhorn sights were aggravating me. I think if I spend a little more time getting used to them I can improve that even more. 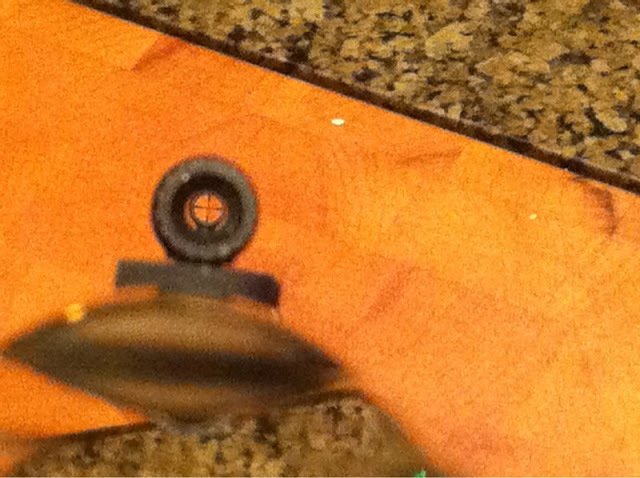 As shown in the picture below I purchased an extra Skinner rear screw in aperture. Skinner's smallest fine rear aperture was un-usable on the Henry, so I drilled it out to the exact sight through width of the KNS sight. The Stock standard aperture was perfect for super precision shooting duties. The rear aperture can be removed completely for a very fast large sighting ghost ring style for field game hunting. Just point it at the object and line up the circles and forget about the cross hairs. This is a huge step up in sighting for the Henry in my opinion. When moving on to the KNS AR sight, the only concern was that you don't have 1/4 turn tuning, only 1/2 turn at a time, but testing proved that was not as big an issue as I thought. On both the AR and the Henry the double peep setup provided me with 1X scope feel and a ton more accuracy. 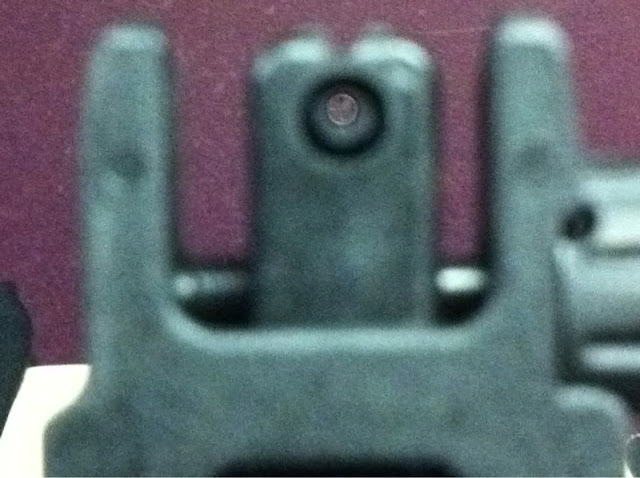 This is roughly my combat sight picture through my Magpul rear sight with the larger combat aperture. Very fast handling and I might add a lot faster on target. This is my very poor picture of my precision sight picture with the fine rear aperture flipped up on my Magpul rear sight. After installing the sights I was impressed with them immediately. As it turns out your eye also lines up a circles inside each other faster than a pin and a circle for me. These seems like the next best thing to having a red dot on your rifle without having to worry about batteries. The duplex reticles also provide ranging and Kentucy windage options and index points that post sights do not. Overall the sight picture is like looking though a small 1X power scope. Many people might say that they don't want to take the chance that the wire will break... why, you would still have a super fast shooting double peep sight even it you accidentally took a screwdriver to the beryllium wires. To me the KNS sights offer very rugged construction that should they fail they will still perform as well or better than post style front sights. Overall I really like the KNS sights and would recommend them to anyone wanting to increase the precision of their rifles. Nice article on the Big Boy (.357/.38). I was looking to get a KNS cross hair sight for mine as well and had a question about the height. From the site below, I have two options for height, .425 or .525. What do you think is most appropriate for the Big Boy in .357/.38? What I did was measure my front sight and use that as the order point. From what I remember the .425 was if you are using the factory buckhorn rear an the .525 if you are using a taller Skinner sight rear.